Amal hails from Beheira Governorate in the Egyptian countryside. She is interested in development and wants to be part of changing her society and country. She sees that the potential for change lies in the hands of young people. She has been active and experienced in the field of education. Throughout her life, she has faced situations that have helped her discover her passion in this field. She believes that life always fascinates her with challenging situations that shape her personality, change her thinking, and make her become a more rational person. Her father gave her the tools she needed to fight for what she believed in; she learned that work was not only for men, but also for women. In 2015, Amal volunteered for 11 entities, including local and international development institutions, charities, student activities, and youth initiatives. In 2016, she launched her, “step by step,” initiative to empower youth from Beheira Governorate for college life and to prepare them for the job market thereafter. In late 2016, she discovered that she was interested in all aspects of empowering women and defending their rights. Through Y-PEER Egypt and Save the Children, she trained more than 4,000 people of both sexes on issues of gender-based violence. She has travelled to 16 governorates in Egypt to raise awareness of development issues such as education, peace building, reproductive health, adolescent health, and youth rehabilitation for the labor market between provinces, cities and rural areas. In 2017, she was accepted as a participant of a training that was organized by the German Foreign Ministry, on project management and the empowerment of girls in Germany . She was selected as the role model for girls in Beheira Governorate and was invited on the Alexandria Channel on Egyptian TV. Amal has obtained many volunteer and scientific experiences and expertises through her affiliation with 4 different universities. She graduated from the Faculty of Sharia and Law at Al-Azhar University; she obtained the diploma of non-governmental organizations at the Faculty of Politics and Economics at Cairo University; she is currently in her first year of her master’s in public policies and evaluation of development projects at the Faculty of Commerce of Assiut University; and she is a fellow of the Lazord Fellowship at the American University in Cairo. 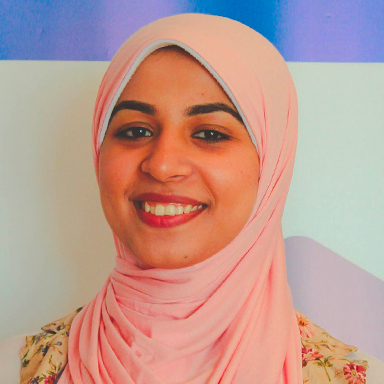 Thanks to her job placement through the Lazord Fellowship at CARE International, Amal is continuing her career in empowering women of different nationalities and defending their rights as she works with CARE’s Women’s Rights Program.